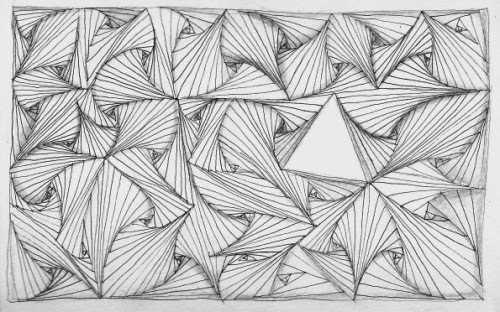 I did this doodle while sitting in jury duty, not actually IN jury duty, but waiting with the rest of the potential selectees, it is a monotangle of Paradox, I just started making triangle shapes, then filling them with Paradox, I left one triangle blank. It's funny, now that it's finished, I can't find the original triangle shapes, the tangle Paradox has an interesting way of blurring the original space-shape that is being filled. After drawing it in with ink, I used a graphite pencil to shade it. I chose this tangle because I didn't have to think too much, I could just do it over and over and still pay attention to what was going on in the room. I ended up being there all day, I made it through the first 2 thinning where they cut people loose, it was at the final selection that I was cut loose, I am glad I didn't have to sit on that jury, I understand it took another 3 days, I wouldn't have minded being on a jury that only lasts a day. I believe I was the only person who brought anything to jury duty, you couldn't take anything electronic, no cell phones, no tablets, not even a MP3 player, most of the other potential jurors were very antsy with nothing to do, they couldn't even tell what time it was without their electronic gadgets to tell them. I have one more month to be on call for jury duty, it's not a bad thing. I used a Strathmore Visual Journal with watercolor paper in it, 5.5"X8". I used a Sakura Micron Pen in 01, Ticonderoga pencil to shade it.